I've been playing with scripts again - hope you like them! They have not been tested in anything other than PSPX but they should work in versions 9 - 12. Leave a comment if you have any problems and I will help as much as I can. 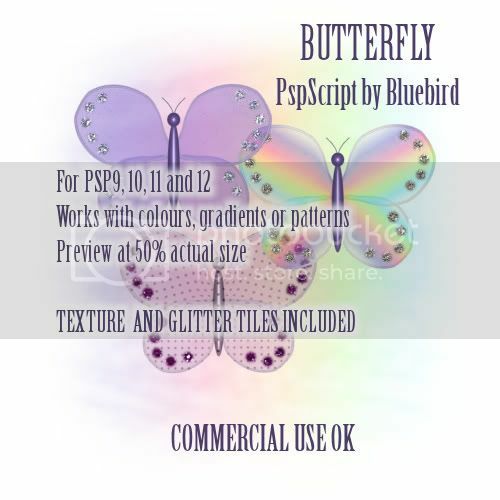 To get the organza effect to work you MUST put the texture provided in your My PSP Files Textures folder and have textures ticked in the materials palette. this is gorgeous thanks so much! Thank you! Your blog post will be advertised on the DigiFree Digital Scrapbooking Freebie search engine today (look for timestamp: 20 Sep [LA 12:00am, NY 02:00am, UK 07:00am, OZ 05:00pm] ). Thanks so much for sharing. Can't wait to try these scripts out! Hi, My name is LadyShannon and I just wanted to let you know we now have a link to this freebie in our forum. Please feel free to visit or join us there at - CU Freebies Only Forum . Again, THANK YOU for sharing all your time and talent with us! Thank you so much for the script!